Every year, between mid-March to about the beginning of April, college basketball starts to take over for a little while. 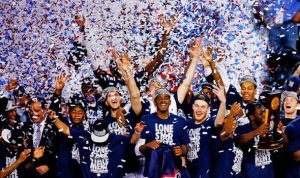 The tournament that takes place over a course of weeks, usually referred to as March Madness, has become so popular it actually accounts for about 85% of the NCAA’s annual revenue! While some are in it for the money, food, drama of a Cinderella story, some are actually interested in how far these teams will actually make it. The NCAA started the tournament that all have come to know and love, way back when in 1939 in an old gym at Northwestern University. The tournament had only started with 8 teams but has since expanded to include 68 teams. It had almost no media coverage when it first began, but with the growth of technology, it spread like wildfire and caught the attention of viewers all across the country. The NCAA created a 10- member committee, which is known as the Selection committee, to select the teams that will play in the tournament. This past weekend, you may have watched Michigan, Loyola- Chicago, Villanova, and Kansas battle for their spots at the Final Four! Tune in this coming weekend, Saturday March 31st to watch as the Final Four go head to head at the last two games to determine which team will go to the Championship! Michigan will be going up against Loyola-Chicago Saturday night at 6PM ET as well as Villanova vs. Kansas at 8:40PM ET with both games airing on TBS! The National Championship will be airing on TBS Monday, April 2nd at 9:20PM ET as well. You can catch all of these games on TBS, CBS, TNT and truTV as well as stream them live on NCAA March Madness Live. If you’re a current subscriber, you can view DISH’s channel guide here to see which channels the games will be on!